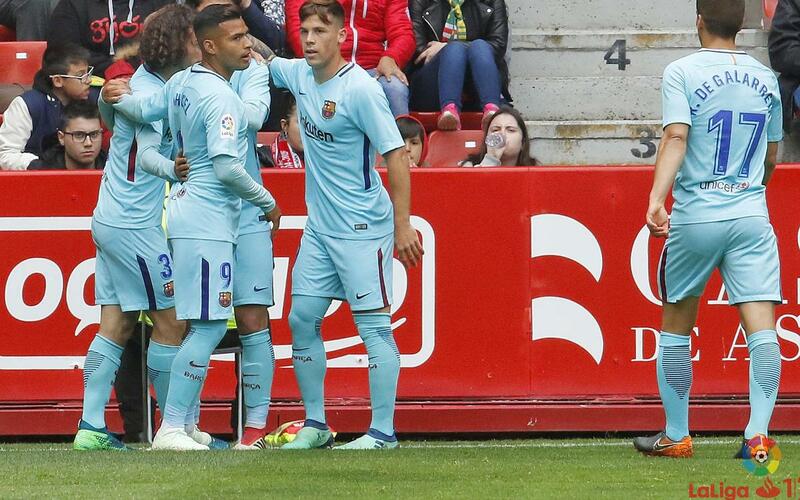 Barça B dominated promotion-chasing Sporting and won all three points thanks to goals from Aleñá, Cardona and Nahuel. Garcia Pimienta's first win as coach has also given the team hope of avoiding the drop. Although the visitors began the better, it was Sporting who had the first real chance when Carmona’s shot rattled the crossbar. El Molinón was silenced shortly afterwards when Aleñá opened the scoring in the 11th minute. He combined perfectly with Cucurella but the locals, driven on by a packed stadium, got back into it on 28 when Rubén García sent a powerful shot into the bottom corner (1-1). As the first half was edging to a close, Barça executed a perfect counterattack and Marc Cardona put them ahead again. As soon the second half started Barça had the first clear opportunity, though they were unable to take advantage and Santos gave the Asturians their second equaliser of the match just after the hour mark. The visitors didn’t panic and continued to attack, and they would get their reward with nine minutes left. Nahuel, who had beaten two defenders, hit an unstoppable shot past Mariño. With Ortolá inspired, Barça held on for victory.